Less than 10 miles from DFW Airport. Less than 20 miles from Dallas Love Field. Conveniently accessible from anywhere in the Dallas/Fort Worth Area and away from the hassle of downtown. We have free parking and airport pickup upon request. 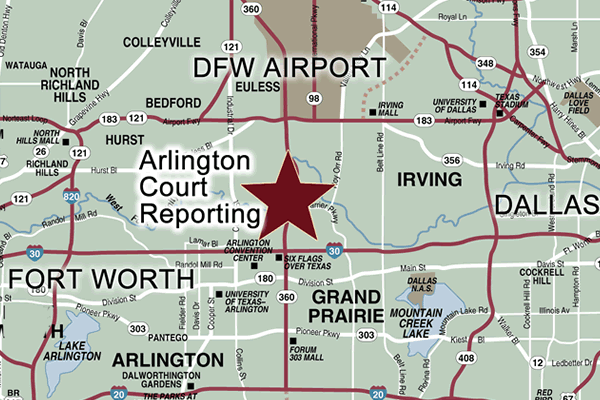 If you are looking for a court reporting firm near DFW airport, we are the company to call. We offer free parking and can provide pickup service at the largest Dallas airport. Choose the most convenient Dallas/Fort Worth Court Reporting Firm. Want more information? Submit the form and someone from our firm will contact you. We love to network with other court reporting firms! We have the closest conference room to the Dallas Fort Worth Airport and will even pick you up from the airport! Our facility is equipped with everything you need from computers to faxes to conference phones and free wifi, we have it all! We provide court reporting services to the following DFW Communities: Dallas, Fort Worth, Arlington, Grand Prairie, Mansfield, Irving, Southlake, Frisco, Forest Hill, Ceder Hill, DeSoto, Duncanville, Haltom City, Azle, Weatherford, Richland Hills, North Richland Hills, White Settlement, Benbrook, Saginaw, Watauga, Crowley, Hurst, Burleson, Bedford, Euless, Collyeville, Keller, Addison, Allen, Denton, Aubrey, Ennis, Maypearl, Midlothian, Lewisville, McKinney, Roanoak, Grapevine, Haslet, Glen Rose, Flower Mound, Kennedale, Haltom City, Joshua, Pantego, Plano, Olivia, Keene, Cleburne, Dalworthington Gardens, Everman, Edgecliff, Westover Hills, Hurst-Euless-Bedford, Rendon, Highland Park, University Park, Lancaster, Mesquite, Carrollton, Waxahachie.